The Core Fascia Roller (TM) is the first of its kind on the market. There are 11 videos of how and where to use the roller on YouTube starring me! follow this link. Made in Australia, the CFR has a solid central core covered with two layers of foam. The inner layer is firm and smooth, while the outer layer is ridged to get into tight muscle areas and release the tension in the best possible manner by compression and release via the ridges. Length @ 32cms x 8.5cms. Easy to pack for travelling. No Refunds for changing your mind and finding it too hard!! 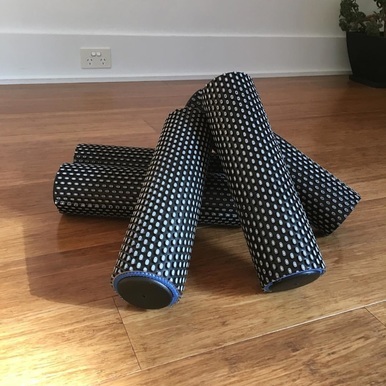 NOTE: This is much firmer than the standard foam roller and as such applies greater pressure to the muscle and can, initially be quite uncomfortable. Once you are used to it, you will not go back to normal foam rollers, as you may find them too 'soft'!